When my little man turned one, we had a monkey-themed party for him. 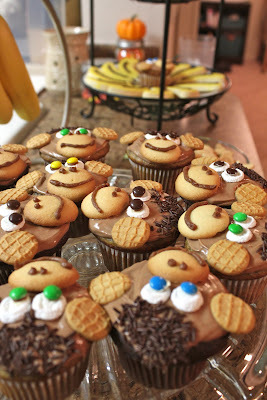 I wasted a whole bunch of time online trying to find the cutest and yummiest monkey cupcakes. Anyway, these cupcakes were the final result of my efforts. I was happy with how they turned out and the hubs and I had lots of fun assembling the monkeys. Naturally, monkey cupcakes should be banana-flavored, right? So, I searched for the perfect recipe. This was it. I loved how moist the banana made the chocolate cupcakes, and like banana bread, these cupcakes were even better the next day--which is perfect if you're throwing a monkey party and want to do a few things in advance. I ended up making half of the cupcakes Chocolate-Banana and the other half plain banana with the leftover batter from the monkey smash cake. They were almost too cute to eat! Preheat oven to 350. Line 12 regular-sized muffin cups with baking liners. In a large mixing bowl, whisk dry ingredients (first 6 listed) together. In a separate mixing bowl, whisk the wet ingredients together (next 6). Add the wet ingredients to the dry ingredients and stir until combined. The batter will be quite runny. Fill baking liners ¾ of the way full. (I like to dump the prepared batter into a pitcher to fill the muffin cups so I don’t make a drippy mess everywhere.) Bake for 20 minutes or until toothpick inserted in center comes out clean. Allow to cool before frosting. Chocolate (or brown-colored) frosting. I frosted some with chocolate cream cheese frosting and some with chocolate buttercream frosting. Mini M&Ms--the red and yellow ones make creepy-looking monkeys!